Manager: Mountain Streams and Trails, Inc. I have been asked by Bart Christner to write a general letter of reference in regard to his current ambition to pursue a career within an educational environment. Bart was a student in my Technical Drawing, Descriptive Geometry and Architecture classes when he was in high school. He He was also the president of our school's Outing Club of which I was the faculty sponsor. Finally, on summer break from college, he was employed as a videographer under my supervision at Mountain Streams and Trails (a whitewater rafting outfitter). I certainly came to know this young man well and to respect him considerably as a learner, worker and as a person. 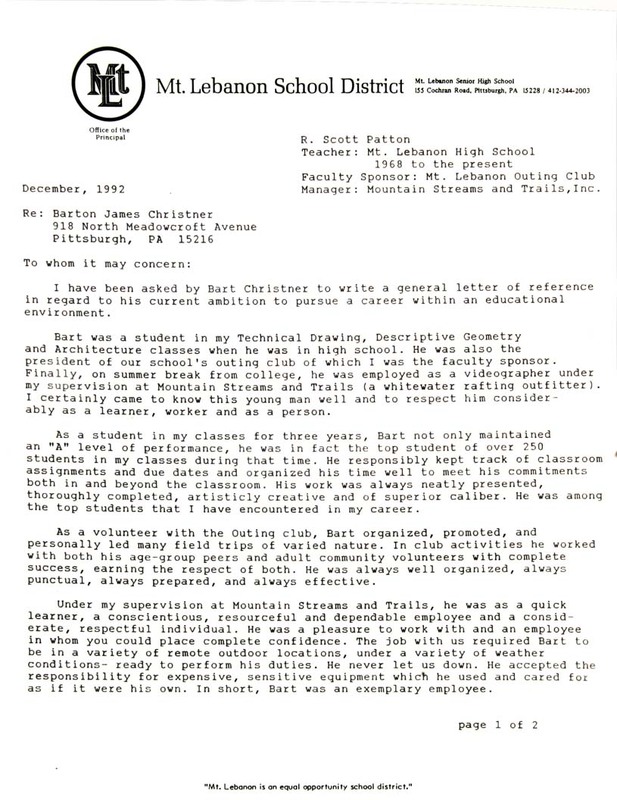 As a student in my classes for three years, Bart not only maintained an "A" level of performance, he was in fact the top student of over 250 students in my classes during that time. He responsibly kept track of classroom assignments and due dates and organized his time well to meet his committments both in and beyond the classroom. His work was always neatly presented, thoroughly completed, artisticly creative and of superior caliber. He was among the top students that I have encountered in my career. As a volunteer with the Outing Club, Bart organized, promoted, and personally led many field trips of varied nature. In club activities he worked with both his age-group peers and adult community volunteers with complete success, earning the respect of both. He was always well organized, always punctual, always prepared, and always effective. Under my supervision at Mountain Streams and Trails, he was as a quick learner, a conscientious, resourceful and dependable employee and a considerate, respectful individual. He was a pleasure to work with and an employee in whom you could place complete confidence. The job with us required Bart to be in a variety of remote outdoor locations, under a variety of weather conditions- ready to perform his duties. He never let us down. He accepted the responsibility for expensive, sensitive equipmentwhich he used and cared for as if it were his own. In short, Bart was an exemplary employee. In summary, I have known Bart Christner as one of my finest students ever. I have known him as an enthusiastic, capable and conscientious employee and as a fair, honest and considerate person with a positive attitude. He is simply one of the finest young men I have known. He will make a lasting positive contribution to any program of which he is a part. I give Bart Christner my highest recommendation!